CNN is owned by the Turner Broadcasting System, which is a division of Time Warner. It was founded in 1980 and runs 24 hours a day, with its headquarters in Atlanta. 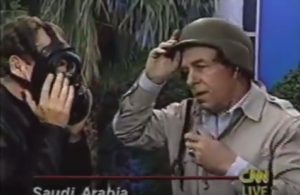 The Persian Gulf War in 1991 was the first event CNN used to catapult its popularity by pretending to send reporters into dangerous territory in Saudi Arabia, when in fact, the entire set was faked from a hotel in the USA. In order to influence public opinion, rather than reporting actual news, CNN faked this “live” report using cheap theatrics, including gas masks, helmets, and background sirens. Surely, some coverage from Operation Desert Storm was real, when captured on night vision cameras with reporters narrating, but after the Charles Jaco fake SCUD attack scene from the Gulf War, people seeking real, unadulterated news began early on to doubt CNN’s authenticity, and for good reason. One of the hardest “official stories” to digest, of course, is what happened on September 11, 2001. Of course, hind sight is 20/20, as they say, and in the aftermath of reviewing the many holes in the “official story” delivered by the US government and mass media, many intelligent “truthers” remember CNN and BBC television announcing the collapse of building 7 too soon, before it even happened. “We are completely uncomfortable with what we have learned about her interactions with the Clinton campaign while she was a CNN contributor.” By October 14th, CNN “accepted” Brazile’s resignation as a CNN contributor. Again, CNN had to “burn the scarecrow” in order to save face as the ultimate fake news network. Wikileaks also revealed Brazile had helped “team Clinton” with debate questions before her Democratic primary face-off with Bernie Sanders and before Clinton’s first two presidential debates with Donald Trump. Hosted by CNN and Facebook, the first debate between Sanders and Clinton showed overwhelmingly that Bernie Sanders was winning the hearts of Americans, especially after he destroyed Clinton in the debate. Still, CNN published fake news that Clinton won the debate, and removed the poll that showed Sanders destroying Clinton 75 to 18. Never again would CNN show this poll. One reason is the fact that CNN’s parent company, Time Warner, is Hillary Clinton’s seventh largest financial backer. CNN’s corporate media foundation is sponsored by the very companies and corporations that funded the Clinton campaign and her insidious tactics to deceive the American public about Bernie Sanders, Donald Trump, the war on terror, and her own vicious and embarrassing emails that got exposed via alternative media and social media alike. Pushing the CNN script of fake news is none other than the king of fake news, one nefarious Brian Williams, the NBC “idol,” who claimed his helicopter was hit by a rocket-propelled grenade in Iraq, only later to be called out as a liar by US soldiers and forced to recant the mass-media-purported lie–all meant to stir emotion and drama for network popularity. (15) Then, MSNBC thinks the world simply forgot that Brian Williams is a profound liar and used Williams to push the “fake news” accusation and script about independent news–the real news and the truth news that helped Donald Trump spread the word about mainstream media being the actual fake news. In fact, Breitbart News published a list of more than 30 times when NBC News allowed Brian Williams to present fake news to the American public. Williams was also caught faking stories about Seal Team 6, the fall of the Berlin Wall, and more. Fake news has no shame, and is continuing pushing the latest fake news script across the board about Russians hacking the DNC emails to expose Hillary Clinton’s fraud and hand the election to Donald Trump. Across mass media throughout September and October of 2016, it was easy to find headlines and news anchors repeating phrases like Trump has no chance to win the election, Hillary is leading in “every” poll, “Donald Trump can’t win the election, and “Trump will never be President of the United States.” (16) Just like so many other scripted lines that resound across mass media, including local TV affiliates and nearly every local newspaper in America, it’s all fake news handed down directly or indirectly from the top, and these fake news channels like CNN dare not report anything contradictory to this script for fear of losing sponsors that fund the fake news to begin with. One gleaming example is when all the fake news media repeated the Obama (Obamacare main slogan) phrase saying, “If you like your doctor, you can keep your doctor.” The same fake news media conglomeration omits, censors, and edits out any important stories they don’t want the public to learn or understand. This was a mind-blowing confession by the leading scientist at the CDC and one of the most important medical revelations of our time, as so many children are now affected for life by autism, which unfortunately can cost the parents their life savings. Research at the CDC was falsified, destroyed, and covered up, all to save face for the dangerous and experimental vaccine industry. From broadcasting in the same parking lot and pretending interviewers are at “hot spot” prime satellite locations, to using green screens to fake backgrounds, CNN is the king of fake news, on television and online. All of their reporters simply read the script they are told to read, and are not allowed to deviate from what’s on the teleprompter, even when they know it’s a lie. Fake news is nothing new to corporate media, as they’ve run hoaxes and propaganda to boost their ratings for decades. In fact, there’s so much fake coverage exposed that all one has to do to find some is to search terms in Google or YouTube like “CNN green screen” or “crisis actors” or “building 7.” It’s all theatre purported as real to fuel an insidious agenda from WashingtonD.C.